Opinions: everyone’s got them. As students, we often hear decisions made by or general messages from those in leadership positions. After 47 years at the university, nearly 30 of which were spent leading UB’s international programs, Stephen Dunnett announced he will be stepping down from the position Sept. 1, according to a UB press release. The university named John Wood, currently the senior associate vice provost in the department, as the interim vice provost once Dunnett officially steps down in September. Hello all incoming freshmen from the pizzeria-strewn, lighthouse-encircled island that everyone loves to hate: Long Island. As a reformed Long Islander myself, I get where you guys are coming from. When you fly into town, you’ll scoff at Buffalo’s one terminal airport. Ten employees from the financial aid office have made “specific complaints” against Director of Financial Aid John Gottardy since his hiring in November 2013, according to a statement from the United University Professions, Buffalo Center Chapter sent to employees last week. Buffalo’s largest print alternative weekly newspaper, The Public, usually features an art print — paintings, drawings, photography, etc. On Friday, NYC Mayor Bill de Blasio announced in a press conference and on Twitter that Central Park would permanently be car-free starting in June, with the exception of the lowered roads that go through the park at 97th, 86th, 79th and 65th streets. As an anti-car citizen of Buffalo, I can’t help but dream of a car-free Delaware Park, which is currently cut in half by the hideous and hazardous Scajaquada Expressway. Going out to eat is always a good time, but choosing where to eat rarely is. Questions of “where do you want to eat?” are often answered with “I don’t know, where do you want to eat?,” endlessly shifting the responsibility of choosing a spot. Lucky for you, The Spectrum is really getting into flowcharts. We got this handy one here to help you figure out where you want to eat — both on and off campus. The city is filled with foods to fit any palate, and they’re all just waiting for you to find them. 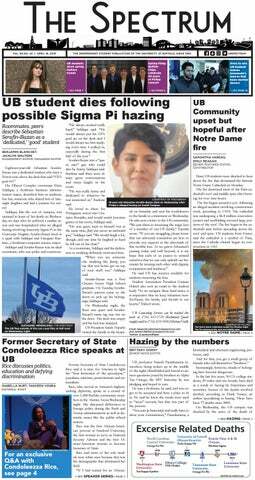 Editor’s note: This is a follow-up piece to an article published in 2015 called “Man vs.
For some, the upside-down cone filling in a pothole near the UB Commons is simply that: an upside-down cone.